I’m driven to write this post because the restaurant in which I have a share is being subjected to a bullying protest action by a group of animal welfare activists. Every weekend night for the past six months they have been outside Le Canard restaurant in Wellington accosting passers-by and restaurant diners with leaflets demanding they “Say No to Foie Gras”. Le Canard (The Duck) specialises in the cuisine of South West France, specifically the Pèrigord region which is home to truffles, cèpes, duck and foie gras. Its customers dine at the restaurant because they like the style of food and the authentic ambiance it offers. No one has to order foie gras; those who do, know exactly what it is: the fattened liver of a force-fed (gavaged) duck or goose. It is not – as the protestors would have us believe – a liver that is diseased/infected with hepatic lipidosis. Can you imagine the health authorities of France or New Zealand allowing a diseased avian product to be sold or exported? The gavage process is not done to make the animal as “sick as possible”, and “many birds” do not “asphyxiate to death” during the process. The highly emotive leaflet circulated by the protestors takes the very worst instances of factory-farmed cruelty and presents it as the status quo. Let me redress the balance. I have worked as an agricultural journalist; I am now a food writer. I have lived in France, I’ve visited foie gras farms, I’ve seen the gavage in action, I’ve discussed the issue with practically every French person I’ve met and I’ve researched foie gras production for a feature I made for Radio New Zealand in 2006. This is what I’ve learned. There are good and bad farmers. Just as New Zealand has farmers who mistreat their animals, so it is in France. Both countries have regulations to keep the worst operators in check; sometimes – as in the case of the Crafar farms – it can take some time for the authorities to act. It is also true that both countries sanction questionable farming practices by law. These laws enable us to farm on an intensive scale and produce the food we like to eat. In New Zealand it is perfectly legal to keep sows in farrowing crates and layer hens in cages where they have little room to move. In France it’s legal to force-feed ducks and geese for the production of foie gras. Both countries set minimum standards and both countries have farmers who choose to farm at a much higher standard. These people farm less intensively, often free ranging their livestock and opting to take less profit for a more natural or artisan operation. So it is with foie gras. Some foie gras is produced intensively; some of it is produced by artisans. In Périgord the producers have formed a regionally defined association to distance themselves from the practices of some factory produced foie gras that has become big business in parts of France but especially in Eastern European countries that have lower standards. The duck and geese farms in Périgord tend to be small scale. The birds are hatched and raised free-range on pasture until the last 2 or 3 weeks of their lives when they go into a barn that’s separated into pens. They are gavaged 2 or 3 times a day in a process that takes less than two seconds per animal (farms are equipped with pumping equipment that delivers a measured dose, quickly and gently) I’ve read about birds lining up to be fed; in my experience this is an exaggeration but they are certainly not perturbed and I’ve seen geese walk off with tails wagging after the gavage. Sheep in shearing pens are handled much more roughly than these birds. The farmers know they won’t get a good liver if the bird is stressed; it’s in their interests to treat them gently. It’s certainly not in their interests to grow the liver as big as possible so the birds can’t stand up. Despite what the activists say about farmers wanting to maximise profits by getting the biggest livers, the premium fresh duck foie gras (classified ‘extra’) is close to 500g; if it gets much bigger than that, the fat simply melts out during the cooking process leaving an inferior product. Some people will tell you it’s natural for a goose or duck to load up on food; it helps them prepare for a long migration. That’s true but not to the extent that it’s done for foie gras. One farmer summed it up for me when I asked if she didn’t think it was cruel to stuff food down a goose’s neck. She agreed it wasn’t natural but said it wasn’t cruel. She genuinely liked her geese and explained that there was a real art to gavaging a bird gently with just the right amount of corn mash. Another farmer who said much the same, also added that it is hypocritical for a New Zealander (me) to suggest the gavage is unnatural when the New Zealand economy depends on forcing cows to produce hundreds of litres of milk when naturally it would only produce enough for its calf. Point taken. In the end we agreed that most, if not all, animal farming is based on pushing natural behaviours beyond what is natural. Now for the bad farmers. You need only search YouTube to find some horrific examples of ducks kept in single cages with necks protruding, ready for the next gavage. The pipe is administered twice a day for two weeks with no kind words or gentle stroking – they may as well be on a conveyor belt. This is undoubtedly the shameful side of foie gras farming but is it any worse than battery egg production? Layer hens may not be subjected to force feeding but they do live in those tiny cages for their entire laying lives – an awful lot longer than two weeks. Just as there are good and bad farmers there is good and bad foie gras. When my French friends buy foie gras in France they make the same distinction many ethical shoppers here make between battery and free-range eggs, or between conventionally raised pork and free range. They buy foie gras (fresh or prepared as a paté) from a local farmer whose reputation they trust. That way they know it will be good quality and that it’s come from a duck or goose that has been free-ranged and well treated during the gavage. Second best is to buy foie gras from one of the established reputable companies that process foie gras from their own contracted farmers in France. Such a company is Rougié. 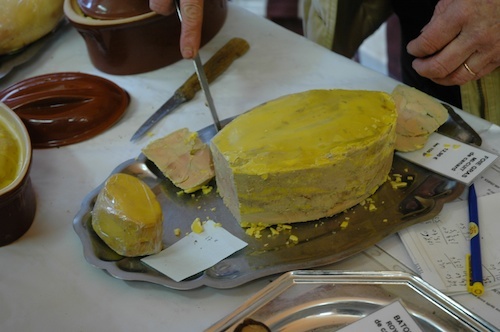 Based in the Dordogne, it has been producing foie gras since 1875. Le Canard buys Rougié bloc foie-gras from a New Zealand importer. People who feel strongly about foie gras would be better to aim their protest action at the governments of France and New Zealand: France for sanctioning the production of foie gras and New Zealand for allowing its importation. But instead of protesting outside parliament or the French Embassy, these activists choose to bully the little guy – a talented young chef who is trying to build a small business in recessionary times. Pascal Bedel chose to settle his family in this country because it gave him a chance to start his own restaurant and because he admired the Kiwi spirit of equality and fair play. After 6 months of provocation from people I can only describe as bullies, I hope he still feels the same way. Anyone who wants to avoid eating the product of a force-fed duck should also avoid eating the readily available imported cans of confit de canard. The duck confit is made from the legs and thighs of fattened ducks. Which means if the protestors really knew what they were protesting against and wished to do it equably and intelligently they should be targeting every business in New Zealand selling imported duck products from France, not just the one small restaurant they’ve identified that serves foie gras. Very eloquently and fairly argued. Go Anna , this is a great explanation of the product . Unfortunately some food activist groups don’t get the picture about effective protest . When Gordon Ramsey was doing a signing at Cook the Books ,we had to call the police to have them removed They were there because he was ,there was no way they were going to get a look in. This was not the appropriate place to make a stand. All they achieved was a public pissed off with them and therefore their message. By grandstanding a business ( the restaurant) they are undermining people’s employment , potential support for their cause and the freedom of choice. Softly Softly catches the Monkey, a saying all opinion changing movements need to adhere to . Thank you for giving an intelligent perspective to both sides of a very emotive topic. Love your work. 🙂 Karen, GM at MenuMania. As a vegetarian and animal lover, I understand the emotions that people feel when they believe animals have been treated cruelly. I also think it’s wonderful that we live in a country where we are allowed to protest against what we consider wrong. I consider farming and raising animals for slaughter to be fundamentally cruel and unnecessary; but this being said, abusive, bullying behaviour is utterly counterproductive. I am sorry that a new arrival to NZ has had to experience this. Well said Anna. These self-appointed “protesters” are in fact just indulging their personal egos (in my view, inadequacies) by public behaviour which is exhibitionist and pointless. Le Canard is a Wellington treasure and if there is one message I can get through as a happy diner there (so far without encountering these people) it is that we are privileged and very lucky to have Pascal Bedel amongst us. If these “protesters” want to make a meaningful statement on food, they could tackle the multitude of places we have serving bad food to people who don’t know better and can’t select/ identify diets which literally in some cases could be helped to save their own lives. But that would involve doing something meaningful and in a courteous way! THank you. That is so heartening to hear. I’ll pass it on to Pascal. As a share holder of course you are going to side with the restaurant and the practice of force feeding geese , despite not having any real evidence to back up your assertions that this is humane and the geese are all good with it. I dont care how much you gloss it over it is still cruelty and by the way sow stalls will be illegal from 2015 in NZ . You say these people are “bullying” the restaurant , they have a right to protest and id hardly call standing peacefully with a few placards handing out leaflets “bullying” more like exercising ones right to freedom of expression in NZ. This group have sent letters to two food places in Wellington regarding Foie gras and thats all that was needed for them to take it off the shelves . If they were to protest the french embassy that would have no effect at all and not be informing potential eaters of this product , by the way the French government has made it illegal to even have vegetarian options in their schools so they would be wasting their time trying to lobby the french government. See the following blog post with my response. Regardless of what evidence you were shown, your closed mind would remain as such. Anna has obviously visited a producer as opposed to yourself, whom has simply been forced feed propaganda via PETA & other organisations for the soap adverse, pot smoker. What has France’s policy on school menu’s have to do with the debate? By mentioning this all you do is display your bias. In all likelyhood the French goverment merely adhere to the reccomendations of the overwhelming majority of nutritionist who advocate a balanced diet including meat. By all means protest, boycott or whatever but do not follow PETA’s lead by spreading lies & exageration…. & do not dare interupt my meal! In response to Cam , i do not follow PETA , i do however know what is right and what is wrong and that animals are sentient . Your post just shows you for what you are , uncaring and ignorant . id love to see a video of a free range force fed duck/geese. its quite hard to believe! They are free-ranged up until the last 2 weeks (for a duck) or 3 weeks (for a goose). At this point they are put into inside pens, in groups, so that they can be contained for force feeding and monitoring. The pens I’ve seen are like long narrow sheep pens, quite spacious with straw and earth floors. but do you have any video of it? just would like to see it for myself. I don’t have a video of it – I did take a few photos at one farm and but I can’t find them. I looked everywhere for them when I put up my blog post. I have recorded an interview on a farm but it’s in French. Next time I’m in France I may try and video the gavage. If you’re interested, Stephanie Alexander’s gorgeous book on the cuisine of South West France has a few pages on foie gras including the gavage. So some farms keep them free range , that does not justify force feeding them . The debate may be closed but I dined last night at Le Carnard, and very much enjoyed myself in spite of a group of “middle class tossers” protesting outside the windows. I suggested to them that 1) they get a life 2) they focus on under fed children 30 kms away in Porirua 3) child poverty in NZ is not a cause it is a reality – that THAT is worthy of protest. By the way the fois gras was delicious. I’ve given them the same arguments to no avail. I think they have backed themselves into a corner where they feel they can’t give up. It has been 10 months now. I’m glad you enjoyed your evening and had a chance to try the foie gras; I don’t think it will be on the summer menu – not seasonal. Hi, I’m coming home to New Zealand from France and wanted to bring some foie gras back for my french friends in Auckland. Has anyone tried to get it through customs in the past? I know I would have to declare it for sure but is it going to be confiscated? Thanks for the info Anna! Yeah I’m loving France but have yet to try foie gras myself. I think I will be getting some home cooked foie gras for Christmas with my friend’s family here though. They always have it for Christmas and special occasions – it’s such a treat. what a treat! I’m heading the other way (NZ-France) very soon and looking forward to some foie gras myself.